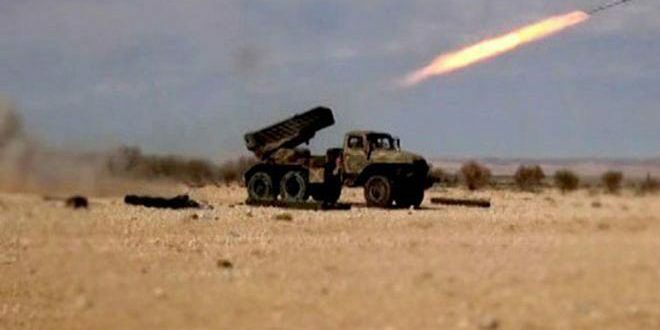 Units of the Syrian Army were involved in fierce clashes with ISIS terrorists in Howeijet Saker area in the eastern province of Deir Ez Zour on Sunday. According to the field reports, army units killed a large number of ISIS terrorists in Howeijet Saker area, while receiving backup support from the Syrian Air Force and artillery units that heavily pounded the gatherings and fortifications of ISIS terrorists in the neighborhoods of Al Jbeileh, Al Aridi and Kanamat, in addition to destruction of their supply routes in the villages of Hatleh and Khasam, located 18km east of Deir Ez Zour city. The airstrikes also destroyed several hideouts in the vicinity, inflicting heavy losses upon ISIS terrorists in terms of personnel and equipment.